Shadygrove Cattery (CFA # 33504) was established in 1979 by Susan Cooper (Kline), in Baton Rouge Louisiana. In those days my name was Susan Lenhard. I loved working with my cats, taking care of them, showing them, and winning with them. 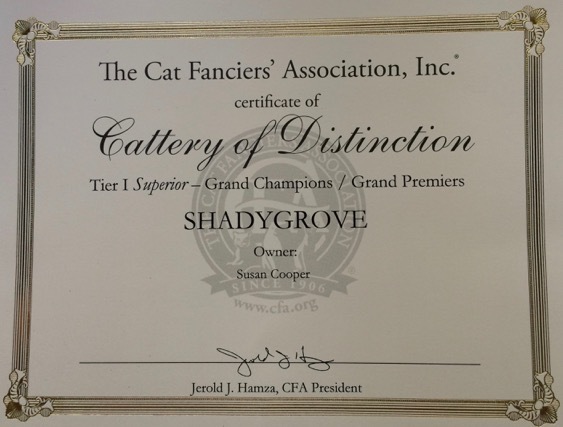 I bred 11 CFA Grand Champions and one Distinguished Merit cat, and earned the Cattery of Distinction award. I am proud to share pictures and pedigree links of my lovely kitties for all to enjoy. Pictured above are three of my Grand Champions. 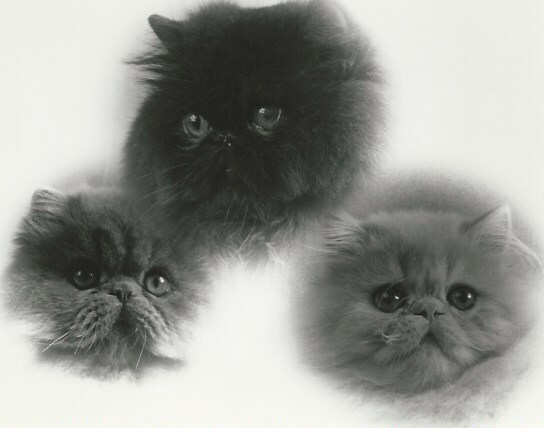 The black male at the top is GC Shadygrove Marquis of Shilow, the lower left is GC Shadygrove Serendipity, a blue male, and lower right is GC, RW Shadygrove Sundance, a cream male. You can see more about them on each cat's individual page.